The Iraq edible oils market is considerably fragmented, with the top 7 players, namely Marsan Gida San Ve Tic A.S., Anadolu Group, Altunkaya Group of Companies, Zer Group, Aves A.S., Yildiz Holding, and Keskinoglu Ic Ve Dis Ticaret Ltd., accounting for close to 90% of the market in 2016. The strategies adopted by key players in the Iraq edible oils and fats market are mergers and joint ventures, investment in research in order to ensure steady development of new technologies, and subsequent smooth expansion of their product portfolio. These seven players are likely to retain a steady dominance over the Iraq edible oils and fats market in the coming years. However, there is significant scope for smaller players in the market. Local production of edible oils and fats is on the rise in Iraq and is being encouraged by the government, which is likely to help the market for edible oils and fats in Iraq by providing an opportunity for smaller players. Etihad Food Company is one of the leading emerging companies in the Iraq edible oils and fats market and is likely to play an important role in the future development of the market thanks to strong local ties. According to Transparency Market Research (TMR), the Iraq edible oils and fats market is expected to rise handsomely in the coming years, with a 6% CAGR expected between 2016 and 2025. The market’s value is expected to rise from US$1.3 bn in 2015 to US$2.3 bn by 2025. 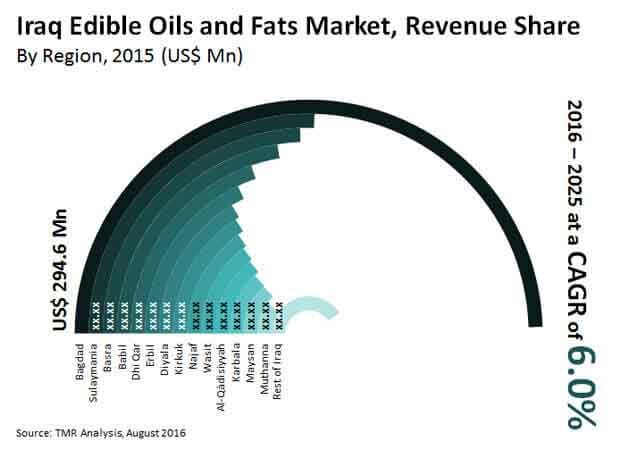 The Iraq edible oils and fats market is segmented on the basis of product type into spreadable oils and fats, vegetable and seed oil, cooking fats, and others. The vegetable and seed oil segment led the Iraq edible oils and fats market in 2016 and is likely to continue its dominance throughout the forecast period. This segment is further broken down into sunflower oil, soybean, corn oil, palm oil, canola oil, and others, with sunflower oil taking up the lion’s share in the production of vegetable and seed oils in Iraq. Spreadable oils and fats in the Iraq market include butter and margarine, with butter likely to dominate the Iraq edible oils and fats market in the coming years. Cooking fats include animal ghee and vegetable ghee, the latter accounting for the major share in the Iraq edible oils and fats market. B2C distribution of edible fats and oils was the dominant distribution channel in Iraq in 2015 and is expected to retain its dominance throughout the forecast period. B2C has been further categorized into the public distribution system (PDS) and others. Public distribution system (PDS) is a food security system that ensures the distribution of staple foods, including edible oils and fats, at a series of fair price shops. Public distribution shops distribute rations at a reduced price to citizens falling below the poverty line and are a crucial part of the Iraq edible oils and fats market. The Iraq edible oils and fats market has been segmented on the basis of region into Babil, Baghdad, Diyala, Basra, Sulaymania, Dhi Qar, Al-Qadisiyyah, Karbala, Maysan, Muthanna, Najaf, Wasit, Erbil, Kirkuk, and others. Baghdad has traditionally been the leader in the edible oils and fats market in Iraq in terms of both revenue and volume. Baghdad is the capital and the largest city in Iraq and accounts for 40% of the country’s total GDP, TMR finds. As a result, its dominance in the Iraq edible oils and fats market is likely to continue unabated in the coming years. The high population of Baghdad is the key factor responsible for the steady growth of the edible oils and fats market in the region. In terms of volume, the Baghdad edible oils and fats market amounted to 190.9 thousand tons in 2015 and is expected to reach 268.3 thousand tons by the end of the forecast period, registering an annual growth rate of 3.5% from 2010 to 2025. Muthanna and Maysan also comprise key markets for edible oils and fats in Iraq and both are likely to exhibit a high CAGR between 2016 and 2025.